Woodland Intermediate School held its first Career Day featuring guest professionals who taught students about career choices including firefighting, dog grooming, being a railroad engineer, working as a seamstress for Nike and many more on Tuesday, June 12. Patti Cutler, a fourth grade teacher at Woodland Intermediate, invited professionals from around the county to teach students about their careers. Students rotated through the different speakers for 20-minute sessions to hear about different jobs and learn about the many opportunities available to high school graduates. Following each presentation, students asked questions to learn more about the different careers. Lori Horseley, owner of the Shabby Dog Salon in Woodland, showed how her staff grooms clients' dogs. Lori Horseley owns the Shabby Dog Salon in Woodland and demonstrated how to groom dogs while also teaching students about running a business. 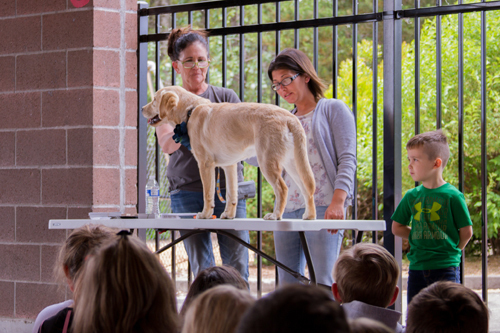 Following her demonstration, students asked about the different kinds of equipment and what techniques groomers use to calm rowdy dogs. Nick Cutler, Patti’s husband, runs a unique delivery service – his company uses raising-flatbed trailers to deliver large pre-made sheds directly to clients’ homes and businesses. 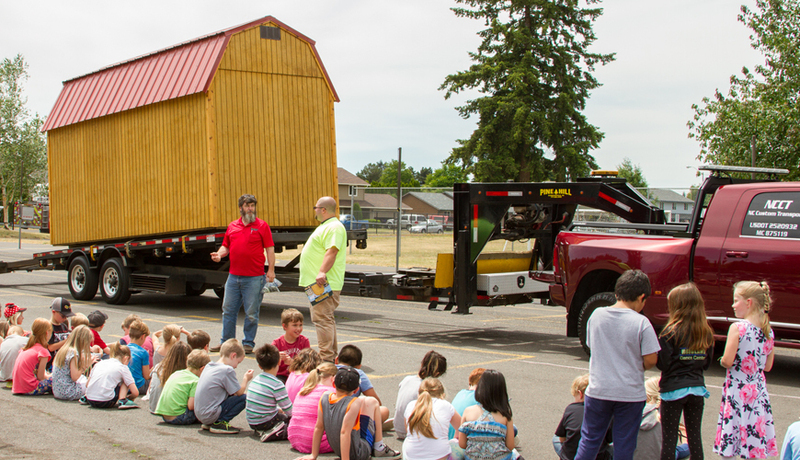 Nick demonstrated how their trucks use pulleys and cabling to push and pull giant sheds on and off their trailers and explained the different issues a driver may encounter while delivering a shed. 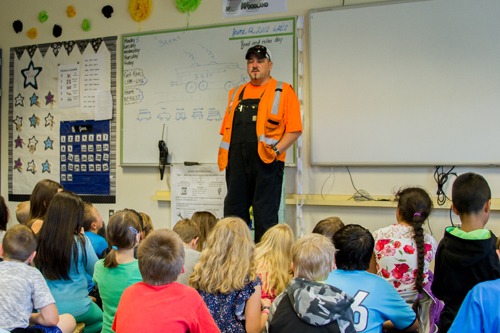 Brent Estep, a railroad engineer for BNSF Railway, taught students about different railroad jobs as well as the importance of railway safety. Brent taught students how trains work, how important trains are to the world economy and even the different kinds of vocabulary railroad workers use such as saying “I’m going to eat beans” instead of “I’m going to lunch,” a phrase stemming for the industry’s beginnings when many workers brought canned beans to eat for their ease of preparation and inexpensive cost. 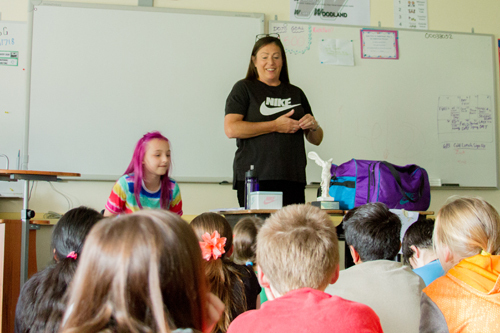 Corinn Campbell, a seamstress for Nike, taught students about working Nike as well as the challenges designing clothes for professional athletes. Corinn talked about how technology dramatically changed the way she does her job. “When I first started, we created our patterns by drawing them out on paper,” she said. “Now, the designs for new clothing and shoes are created entirely using computers.” Over her years at Nike, Corinn worked as a supervisor and also met famous athletes who needed special clothes designed for their unusual body sizes including Michael Jordan among many others.